A Wisconsin man died from a lightning strike this week, the 35th person to get struck and killed this year. The total number of lightning deaths continues to climb higher, and now 2016 has the most lightning fatalities since 2007. 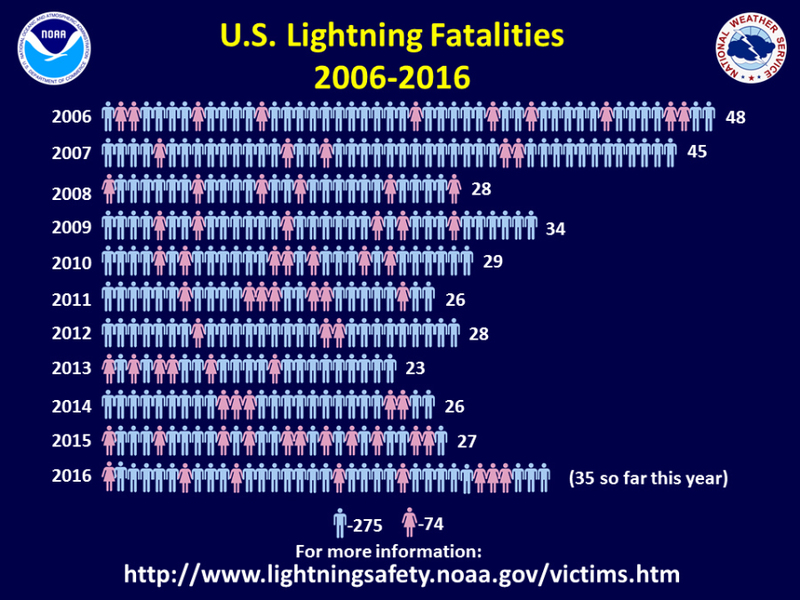 Lightning deaths were slow to start in the spring with a relatively quiet March, April, May and June when only nine people total were killed by lightning. That changed in July and August as a total of 24 people died from lightning — 12 each month. August was the deadliest August for lightning strikes in the last 10 years. This most recent lightning death is the second in September. So why the surge in lightning deaths in a time when awareness campaigns for lightning safety are so prevalent? One possibility is because it's been such a wet summer, which means more thunderstorms and more opportunities to be struck by lightning. June was an especially dry month across the entire US, and that's also the month when lightning strike victims tend to rise. Instead, the number was below average at only four. July and August, however, were much wetter, and therefore provided many more opportunities to be struck. This is just one possibility. There could also be more people ignoring warnings and staying outside during bad weather.